"We'll ice the lineup that gives us the best chance to win," is a common refrain among NHL coaches. Right now, and as long as his team continues to start Ben Bishop over Andrei Vasilevskiy in net, it just isn't true for Jon Cooper's Tampa Bay Lightning. Since he was drafted 19th overall at the 2012 draft, all the talk surrounding Vasilevskiy has been that he's "the future" in the Lightning crease. Based on his performance thus far in 2016-17 and that of the team's current number-one guy, the future is now. 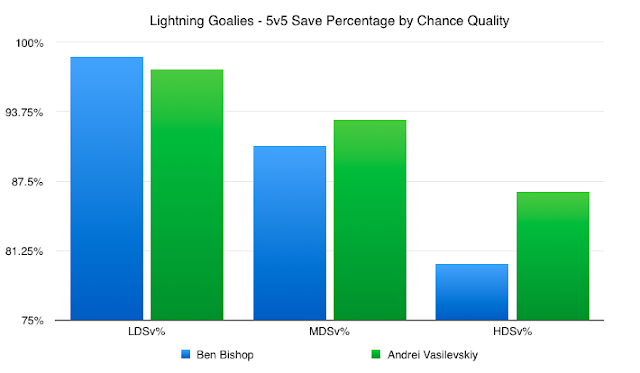 While Bishop has struggled mightily in an admittedly small sample size, Vasilevskiy has thrived. As the Bolts continue to plod along in what should be a ripe-for-the-picking Atlantic Division, it's time for the goaltending equation to become a "What have you done for me lately?" sort of game. 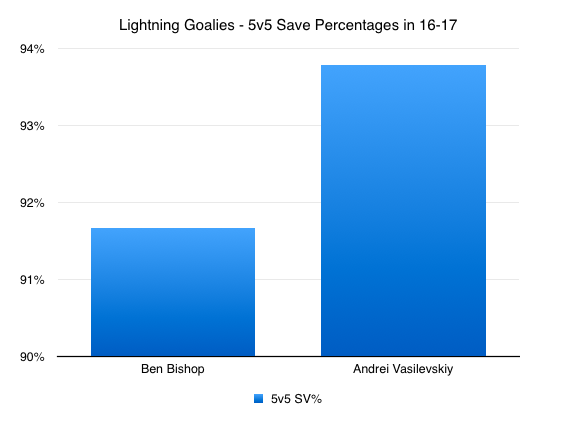 It's true that Bishop has been a real MVP for the Lightning since coming over in that franchise-defining trade with the Ottawa Senators a few seasons ago, but ridiculous saves made last season aren't helping the Lightning win right now. Yes, Number-30 has been beaten by bad bounces, weird deflections, and other strange happenings. At some point, though, the team needs him to start coming up with a miraculous save or two. To this point in the year, it just hasn't happened. If you extrapolate that chart, it tells you that for every 100 shots faced by each goaltender at five-on-five, Vasilevskiy has stopped approximately two more than Bishop; two extra goals against every few games starts to reflect itself in the win-loss column. Further to that, Corsica.Hockey provides great goaltender-based resources, allowing 'fanalysts' like me to delve deeper into the numbers. The overall five-on-five save percentage comparison tells one story, but what if we break it down by the quality of the chances against? In the absence of any compelling evidence, I would typically lean towards the latter conclusion and advocate for a continuance of the 1A/1B goaltending rotation. But, there is compelling evidence to suggest that Argument #2 may not be the most sound. It was mentioned already in this blog that Bishop has received his fair share of bad luck this year, with weird deflections and bounces plaguing him on what feels like a nightly basis. Is that what is holding his HDSv% down? Maybe a bit, but not by much. His current-year high-danger save percentage sits at an even 80%, while his career average since 2013 is 81.86%. At the mid-danger level, Bishop's current year mark is 90.65%, with his average since 2013 sitting at 91.79%. Bishop paying back his debt to the Goalie Gods for last season. He's not as good as he played last year. But he's not this bad either. So, yeah, the odds are that Bishop will rebound and be better than he's been to date, but it feels to me like the expectation out there is that, when that rebound comes, it will be to the levels he reached last year. That just doesn't seem like a reasonable expectation. Another thing worth noting is that Vasilevskiy has seen a decent enough improvement in the low-danger save percentage category. His career average is 96.08% (bad! ), but this season he is clicking along at a 97.59% rate. It's still not great, but the improvement compared to the career average is promising enough that I'd be willing to roll the dice on him for a string of games. The bottom line: Andrei Vasilevskiy is indeed the goaltender of the future for the Tampa Bay Lightning, but there's no reason that he can't (read: shouldn't) be the goaltender of now as well, at least until Bishop starts to pick things up. The Lightning just can't continue to send out a .902SV% goaltender as their number one guy, with a potentially elite young goaltender sitting on the bench.